Just saw this article from mid-April from Cnet on what to do with old iPhones… here’s a snippet, "It's pretty amazing. Indeed, once you start using CollabraCam, I guarantee you're going to start hunting down more old iPhones to add to the mix." 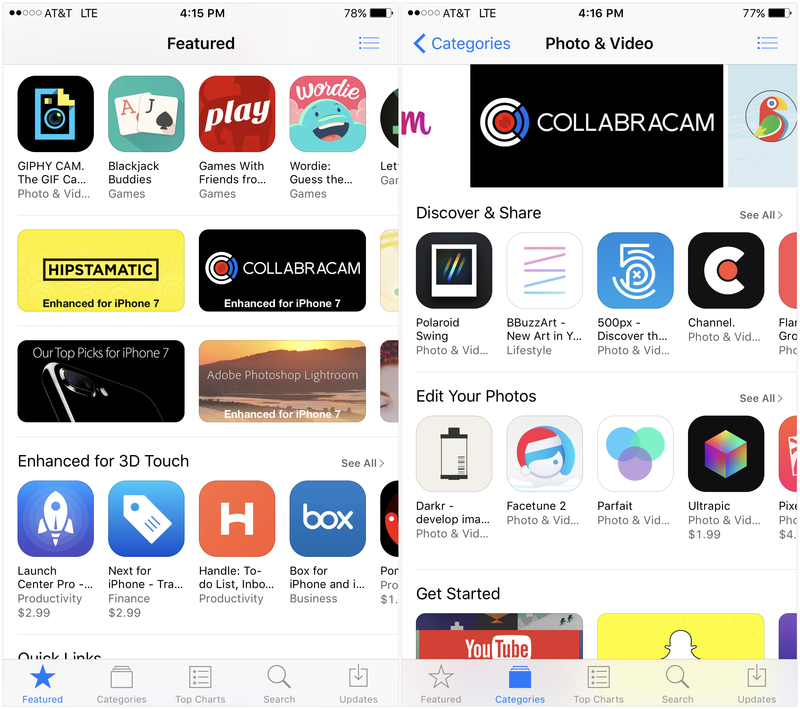 CollabraCam is featured on the App Store! 33% OFF for a limited time while featured on the App Store. Regular price $5.99, get CollabraCam for $3.99 while you can! Have a Merry Christmas and a Happy New Year... CollabraCam it! I’m starting the blog back up. 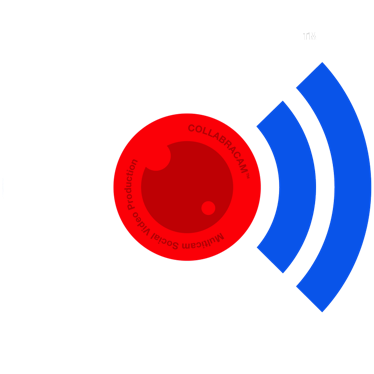 I hope that you will join in, and in the same spirit of collaboration with creating a video with CollabraCam, the blog will be our efforts, together. I would love to feature your CollabraCam videos. Please join in and submit your videos for feature on the blog. CollabraCam Makes Multicam Video Production A Social Experience... In Real Life. GRAND RAPIDS, MI., Dec 14, 2016 - Apptopus Inc. is proud to announce the availability of CollabraCam 3.0 on the App Store. CollabraCam captures video different... this is the update everyone has been waiting for. Now all cameras record the entire session while an Edit Decision List (EDL) is created during the live edit to record in and out points for the Director’s Cut. This change also paved the way for Single Source Audio, which utilizes audio from Camera 1 for the entire session. The camera has also been improved to increase performance and enhance the user experience... Video Stabilization (for supported devices), Focus and Exposure Lock, Thirds Grid, Zoom and iPhone 7 Plus Dual Camera support. Most importantly, transfer time has been reduced yet again, so you can wrap and review quicker. Whether you want to cover all the bases at the little league game, produce a You Tube talk show, create a hyperlocal newscast, shoot a music video, capture footage for interview-style documentary, or help students learn cinematography... CollabraCam makes all of this possible by putting a live multicam production studio in the palm of your hands. You are the director and your friends are your camera crew. From an iPad you can edit live from up to six iOS cameras streaming over Wi-Fi. Send action cues and direct your camera ops to get the best shots from every angle. When you call it a wrap, the video and audio is collected and the Director’s Cut is assembled, so you can watch or share your movie, minutes after it’s shot. CollabraCam doesn’t use your data plan, so you can use Personal HotSpot to create a local Wi-Fi network and CollabraCam on the go. You can also use a wireless router on location, absolutely no need for an internet connection, plug it in and you're ready to go... or create an ad hoc network with a MacBook Pro. Review the Director’s Cut in the app or export to the Photos app and share from there. Once exported, iCloud Photo Library can automatically upload to iCloud, then you can download with the Photos app on your Mac. Export video clips from the Director’s Cut to Photos and assemble in iMovie for iOS, then add your titles and transitions... or save the EDL, video and audio to your Mac and import into Adobe Premiere Pro CC 2017. After import, the Director’s Cut is loaded to Premiere Pro’s timeline, ready for post. You can also import just the video and audio and re-edit with Premiere Pro’s multi-camera editing interface with the Program Monitor. CollabraCam participates in the iTunes Volume Purchase Program for Education. The Volume Purchase Program for Education lets educators purchase world-class apps, like CollabraCam, at a 50% discount when purchasing quantities of 20 or more. Purchase in volume and tap into immediate benefits for your entire institution. The CollabraCam 3.0 update is free for current users and $5.99 USD (or equivalent amount in other currencies) on the App Store in the Photo & Video category and requires iOS 10 or later. Apptopus Inc. based in Grand Rapids, Michigan develops native iOS apps. Our mission is to conceptualize engaging, user-centric apps. We design and develop apps that push the limits of iOS hardware to deliver innovative solutions to complex ideas in the simplest way possible. Copyright (C) 2010-2016 Apptopus, Inc. All Rights Reserved. CollabraCam is a trademark of Apptopus Inc. iMovie, iPad, iPhone, iPod and iTunes are trademarks of Apple Inc. Premiere Pro is a trademark of Adobe Systems. Founder / CEO, Apptopus Inc.
©2010 - 2016 Apptopus, Inc.